Valentines Day Is Approaching and You Are GO For Chocolate! It can be easy to succumb to the mindset that anything that feels like a treat is bad when you’re dieting or trying to lose weight. There are, however, some exceptions to this rule; and chocolate (specifically dark chocolate) is one of them. If given the choice between dark chocolate and milk chocolate, always choose dark chocolate. While it may not melt quite as quickly on your tongue, it’ll always be lower in fat than milk chocolate, and will likely contain less sugar. And because dark chocolate is more concentrated and rich tasting, you won’t need as much to satisfy your sweet tooth. You might be surprised to know that chocolate is one of the few decadent treats that can actually be beneficial to your body. Antioxidants are found in abundance in this rich, satisfying indulgence. So throw out all those teenage cautionary tales warning against candy bars causing acne. 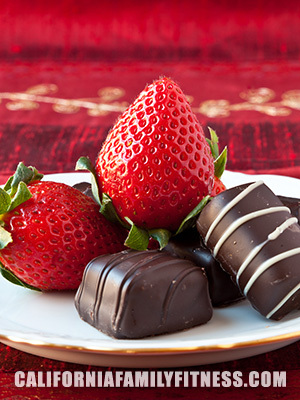 Antioxidant rich chocolate is actually good for your skin. Dark chocolate has also been touted as helping to lower blood pressure, reduce the probability of a blood clot and even slow the formation of the damaging plaque that leads to arteriosclerosis. Combine some good solid cardio with a little chocolate, and you just might have uncovered the secret to longevity. Lets not forget about how chocolate makes us feel! Even a small amount of chocolate will release pleasure inducing endorphins in the brain, creating a feeling of well being and centeredness. It’s no wonder that it became the candy of choice for such an amorous holiday. Yes, you read that right. Research published recently in the Archives of Internal Medicine claim that people who eat chocolate on a regular basis tend to have a lower BMI than those who abstain completely. Just imagine all the dieters out there right now, singing the praises of science! All signs point to a Valentine’s Day indulgence. But we should remember that all of these findings are only valid when chocolate is consumed in moderation. Calories and fat are still calories and fat. The trick is to splurge in a controlled manner and avoid any guilt, knowing that you’re not breaking your diet or doing yourself harm, but luxuriating wisely on a well deserved treat.